So. I put little notes in my six-year-old's lunch. Stuff like, "Have a good day", and "I can't wait to see you." 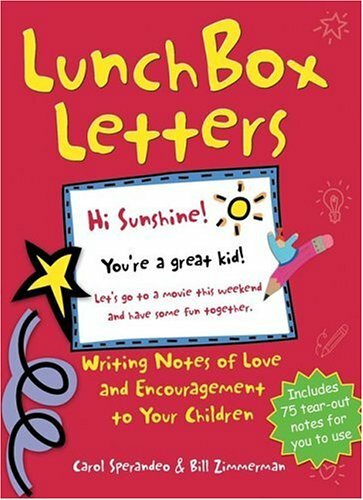 And LUNCHBOX LETTERS helps me do it (you can find it on Amazon). Each page in this helpful book has tear-off sheets with different headers like: "I'm Sorry", "Almost The Weekend", "Happy Birthday", "You're A Terrific Kid", "Miss You", etc. and then spaces for you to leave your own message. My six-year-old loves the notes and saves every one. But my very big boy told the teaser boy that he wasn't being nice. And that he was just jealous that his mom didn't write him notes (score one for the home team)! Little did he know how close to the truth he probably was. Bullies deal with their own issues too! P.S. Go check out (my CP) KATE WALTON'S book cover HERE! SO happy for her! Aww. So sweet. And your very big boy was right. That teaser is just jealous. Lunchbox notes FTW! I think that is so cool. Also love your son's response to the kid teasing him. A note with a joke is pretty cool. Aw I remember these days. Enjoy them! Good for him! Mom takes care of that stuff in our house, too. You keep it up, Christina. And, mail him some notes, too, if you get the chance. They're more important than you think. After my daughter passed away (she was 20), I was going through her things and found an old shoebox. She had saved every single note, drawing, and card I had ever given her from kindergarten through her last birthday. You just might have to stop putting them in his lunchbox! Come visit and enter the give-away! Your days aren't numbered yet, Christina. When my oldest was in third grade, he asked me one day why I didn't put notes in his lunch like so-and-so's mom. I did it once or twice then forgot. Oops! Stupid kids (the teasers that is) ruining your fun!! You big boy rocks!!! Good for him. And the notes are great. How CUTE!!! If I had a young child, I'd be all about that! I used to tuck in little lunchbox mysteries which came from a book. Oh, how she loved those! My kids are all older now. What's nice is when they get older they come back around to wanting your notice again. They even hug you in front of their friends and then all their teenage friends hug you too.